I have a vision. I believe that everyone can have a life full of magic. We all can live magical lives! So can you! If you choose to see the magic, you will start seeing the magic. If you focus on the good, more good will come to you. It’s so easy to start making small changes in your life! And all these small changes will become a big change. I’ve changed from someone who was complaining all the time, to a shining, happy woman who enjoys even the smallest moments. And yes, I do have my moments that I feel bad, sad, worried, or whatever. But I don’t stay in it for too long. Because I know I have a choice to feel better. And I love choosing something that feels better. You too can do this! You can always choose something that makes you feel happier. And then another thing that makes you feel happier. If you follow this good feeling you will start creating more and more magic in your life. You will experience more and more happy and joyful moments. Your life will become magical. You will shine! Now tell me, what is holding you back from doing this? Why aren’t you choosing to feel better? Are you afraid to shine? Are you afraid you will lose friends if you shine too bright? Or are you just afraid of the unknown feeling of it? Because you’re not used to it yet? Know that you can choose to let these fears go. Just say to yourself: “I now choose to let go of all these fears that are holding me back from shining my light, from being my happy, shiny me”. Because you know, holding on to those fears is really a choice you’ve made. And you can always make another choice. You can always choose to feel better. You can always choose happiness. You can always choose magic. Are you ready for the magic? 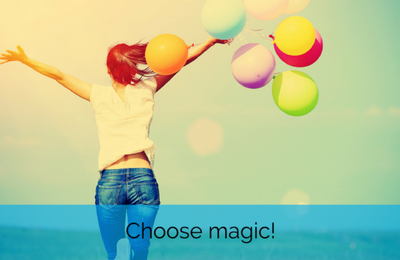 If you choose to make your life one filled with magic and joy, then come follow me on my facebook page where I share my tips and insights on how to create more magic in your life. I also share many of my magical meditations that are a powerful tool to help you create more magic in your life! Let’s do this together!